I’m always on the search for ways that I can use the extra vegetables laying around in my fridge and on my countertop. I hate throwing away rotten vegetables, knowing that I definitely could have used them had I not been so lazy. Food waste guilt is real. At our company Yumi, we donate any unused produce back to the community, turning them into meals for families in need. Unfortunately, I don’t think anyone would want my week-old beet or the bunch of semi-wilted kale sitting at the back of my fridge. Thankfully, when in doubt, I turn my veggies into chips. They’re surprisingly fairly simple to make. You just peel and slice the vegetables on a mandoline, like this one here, and then spread them along a paper towel. I sprinkle a little bit of salt to remove extra moisture— and let those sit. I pat them dry and pop them on a baking sheet. Then comes the easy part – bake. And if you forget about them? Don’t worry. These chips can bake anywhere from 1-1.5 hours, depending on how crispy you like your chips. Get creative— it’s hard to go wrong here. Whether you're using beets or any other vegetable, this recipe is bound to be a crowd pleaser. Begin by peeling beets and slicing into thin slices on a mandolin. Lay out a few large pieces of paper towels and lay out the beets, making sure not to overlap. Sprinkle the beets with salt, and allow the beets to rest on the paper towels for about 30 minutes. Taking a second layer of paper towels, dab the excess moisture from the beets. 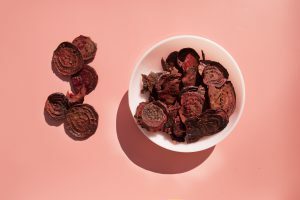 Transfer the beet slices to a baking sheet that has been lined with parchment paper (crucial step!). Sprinkle the beet slices with onion powder, garlic powder, black pepper, or whatever spices and seasonings you prefer. Bake for 1-1 1/2 hours (depending on how thin the beets were sliced / how crispy you like your chips) at 250F. Allow the chips to cool, and enjoy!